Register before June 7 for best rate. Go West Summit introduces the world’s top international tour operators to specialty suppliers offering tourism-related products or services in the American West. 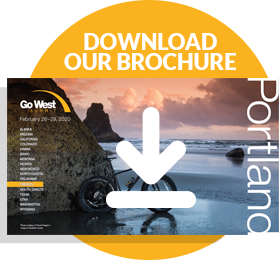 Taking place March 24–27, 2020, Go West Summit partners with Travel Portland and Travel Oregon to present the ultimate business-to-business tourism convention experience with a side of adventure! — Mariette, TRAVALCO USA Inc.
Go West Summit is the single source for international tour operators to design, develop, and maintain an American West tourism product. With nearly three decades of delivering results, Go West Summit is an event where strong, profitable, and lasting relationships are born. Go West Summit provides an environment in which domestic suppliers and international tour operators participate in multi-day networking sessions and experience pre- and post-event familiarization trips with the goal of showcasing the destination for future tourism business. Our effective and easy-to-use custom-designed matching software guarantees a minimum of 20 pre-scheduled appointments while providing a maximum meeting experience. Your ROI is increased by computer-matching tour operators from around the planet with western U.S.-based suppliers in a one-on-one, business-friendly environment. All buyers must be an established international operator selling pre-packaged or customized multi-day tours to Go West Summit states and produce a brochure and/or website promoting these tours. Pre-qualified media are invited to attend with a complimentary registration.